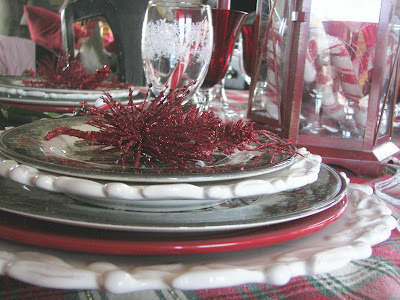 A Merry Welcome to Red Couch Recipes and to my "Step Into Christmas" Tablesetting. 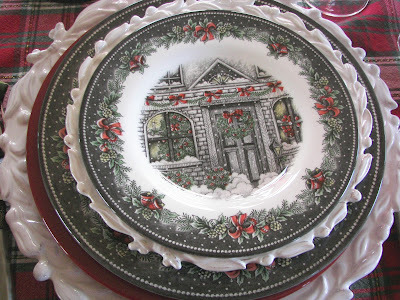 These transferware plates remind me of an old-fashioned Christmas -- snow, a wreath, and tree peeking out of the window. You just know that as you walk into the home, all the indoor trimmings will match the outdoor trimming. 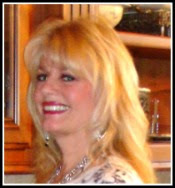 My sister Jacqueline gave these to me recently -- 16 dinner plates and 16 salad plates -- whoo hooo! She said I need 16 for all my future grandchildren that are sure to visit in the Christmas season! When I was in college at Brigham Young University, right after finals one year, my roommates, friends, and I left to go to California to see BYU play in the Holiday Bowl. On the way there, it snowed and the mountain pass was closed. We sat for six hours on the freeway!! It was at least a 10 hour drive there and then with the added delay it seemed like forever to reach the home of my roommate's parents. When we came to their home in Southern California, it just looked, smelled and felt like Christmas. We had just endured this long trip and when we walked into her parent's home I had literally Stepped Into Christmas. I am old-fashioned and am still a sucker for green and red at Christmas. 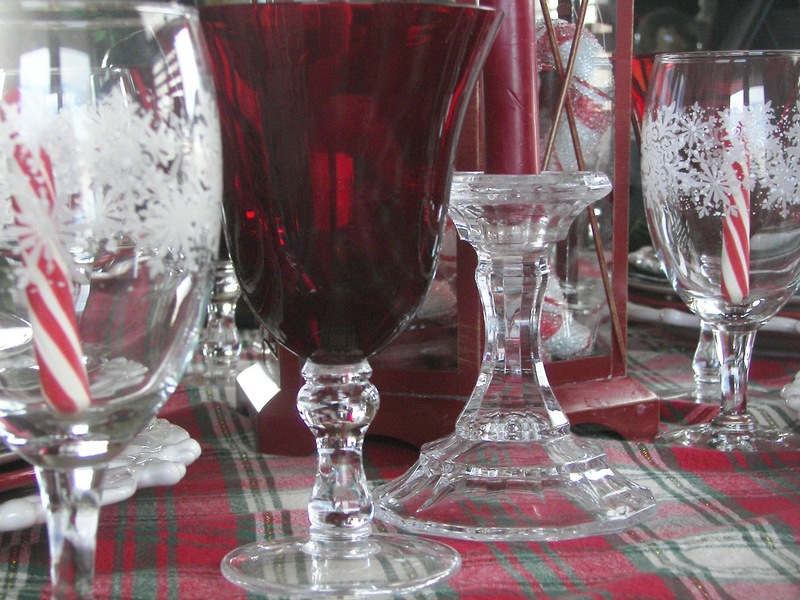 Love these new snowflake goblets. 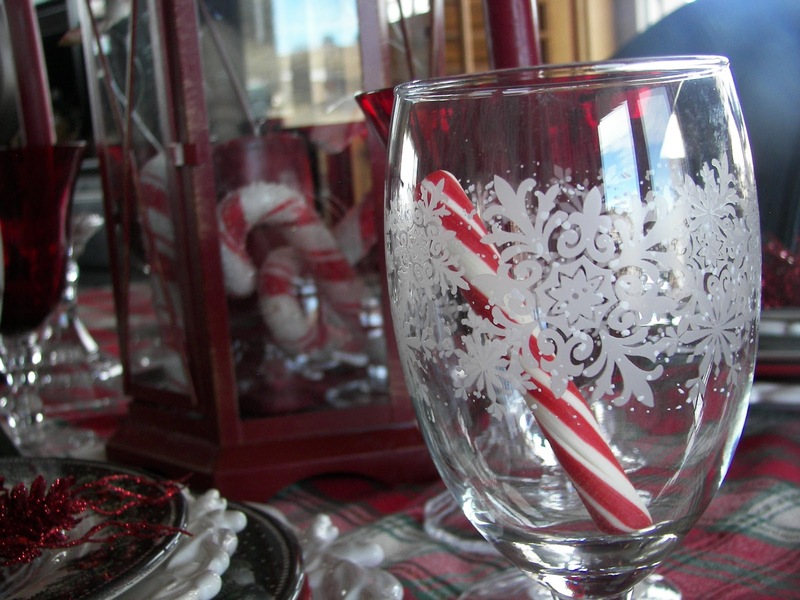 Crystal and red are always another favorite at Christmas. I filled the lamp with some festive candy canes. It is just so Christmasy! Thanks for dropping by Red Couch Recipes where the Christmas fun has just begun! 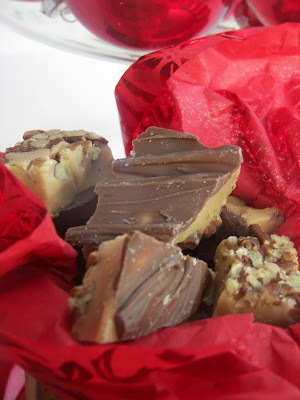 My Hodgson Mill $25 gift code giveaway ends tonight. Click HERE to enter. I love your traditional tablesetting. I am such a sucker for plaid. It says Christmas like nothing else. Beautiful. Beautiful! Great sister! I will take her!Thanks for sharing your lovely table. I love these dishes! (I picked up some too!) Their coloring and design attracted me immediately! What a generous gift your sister gave you (16!!) wow! I like your lantern filled with candy canes- cute idea! 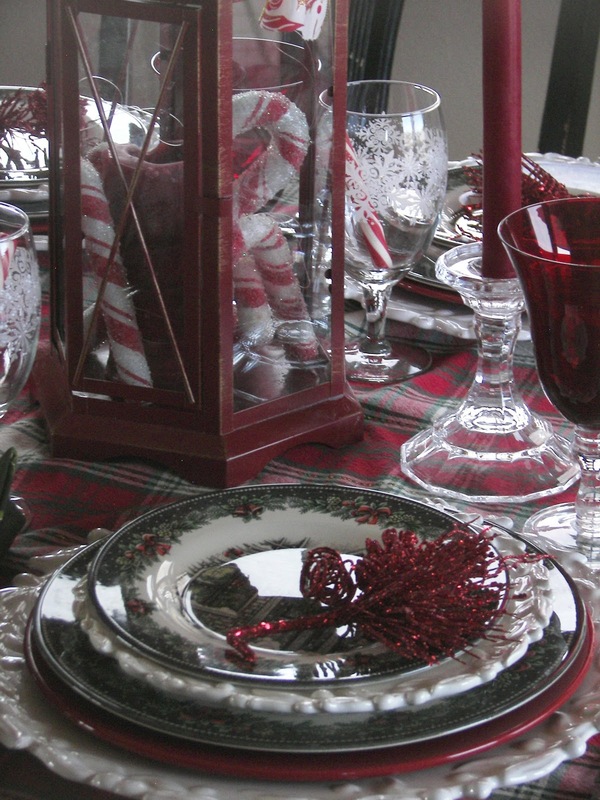 I do love the traditional plaid for Christmas too- perfect with your dishes! I love red and green too. . . Especially red! I always have to add a bit of red to my decorations! Gorgeous! Love these dishes. The red-white combo is fantastic. Thanks for sharing. Merry Christmas to you and your family. I can feel the warmth and love coming from your tablescape-its going to be beautiful. Beautiful table and you can't go wrong with red and green. Your dishes are beautiful...such a nice sister, planning for your future grandchildren!!!! Those plates with the house scene are absolutely amazing...I'd like to step into that front door...it might be like visiting your house. Absolutely beautiful. Oh your traditional setting is beautiful. I love your plaid and those oversized napkins are great. Wonderful Christmas china too. I also love a traditional Christmas of red and green! Your table is beautiful and your sister is a DOLL. Your traditional colors are wonderful. 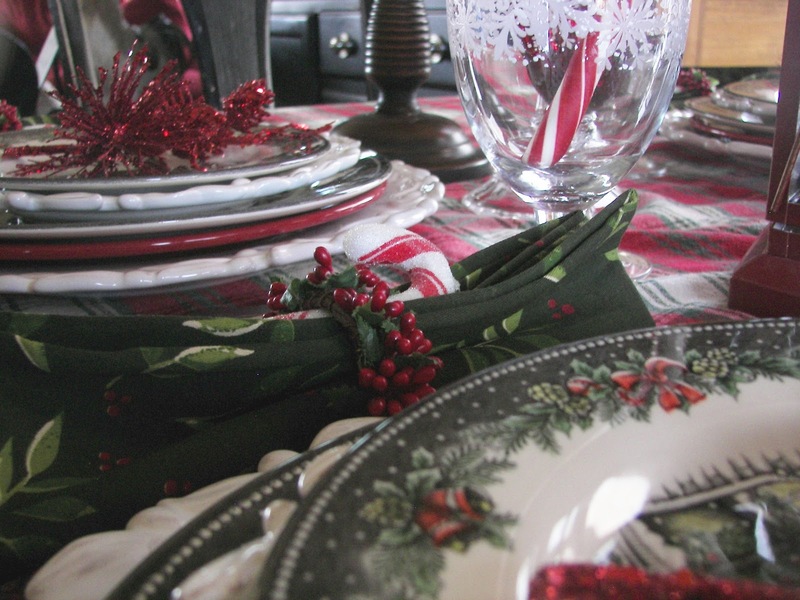 Love your Christmas china and plaids. This is so Christmasy and delightful. It is very Christmasy-I love the china! LOVE(!!! )your Christmas dishes! I'm a huge fan of a traditional --even old fashioned--Christmas! 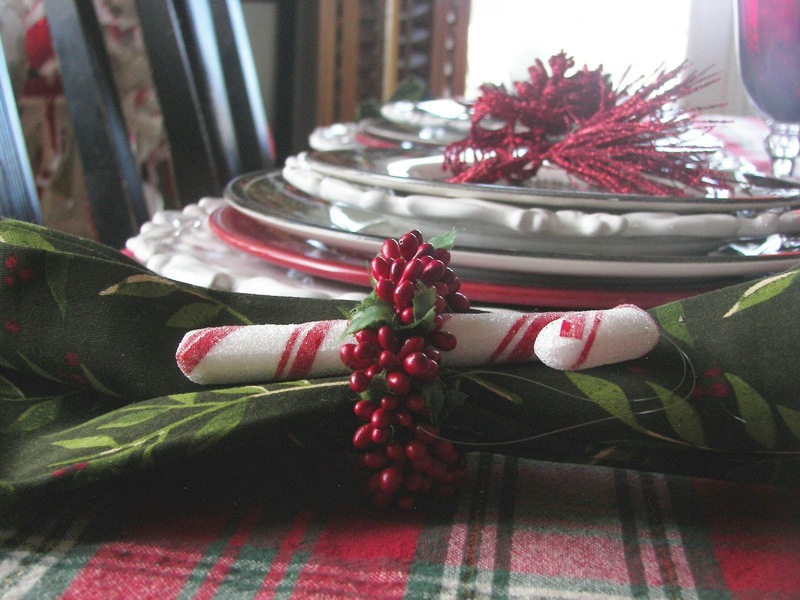 The red and green look incredibly festive and beautiful on your table. Keep showing us peeks of your Christmas decor! Oh, that is beautiful...love the transferware plates, they really show up against the snowy white plates. Talented Joni, I adore your pretty combination and your red goblets are smashing! When's the party? I'll bring treats!!!! What a beautiful gift from your sisiter! I LOVE the plates~they just make me feel warm all over. Your whole table is so beautiful and inviting, Joni! Joni, I like the traditional colors of Christmas too. Your table is warm and inviting. I'm ready to pull up a chair and indulge myself. 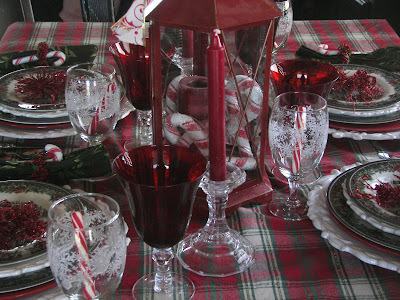 I'm old fashioned and traditional too, and your table made me feel as if I had stepped into Christmas. Loved it! I just saw these dishes for the first time last night and LOVED them, and now here they are on your table--so I can see them laid out :) . What a sweet gift and message from your sister! The table is beautiful. I love that you didn't go with more black on your table, and that you didn't go just with red--the green adds a lot to make it as beautiful as it is. Thank you!